It is fair to say the race for promotion and battle for survival in National Two North has been gripping this season and as we edge towards the end of the campaign, there is still an awful lot to be decided. This Saturday, two of the frontrunners take on two sides battling to stay in this division as league leaders Sale FC visit Wharfedale while second placed Sedgley Park take the trip to Blaydon. The hosts are separated by one place and three points and the same applies for Sale and Sedge heading into this weekend so expect an intriguing round of rugby. Third placed Tynedale will be watching those two results with intrigue when they go to Otley while Stourbridge and Hinckley will be aiming to keep their promotion ambitions alive when they take on South Leicester and Luctonians, respectively. Elsewhere, Sheffield host Macclesfield aiming to reignite their survival bid while Huddersfield face Leicester Lions and Chester welcome Sheffield Tigers to Hare Lane. Last time out, it was a huge step towards promotion for Sale FC. A 16th straight win over rivals Stourbridge left them eight points clear at the top of National Two North. Jonathan Keep’s side did see their lead cut to three points last weekend as they weren’t in action, but with a game in hand and in control of the title race, the men from Heywood Road are in a wonderful position to take the step up to National One. They will be aiming to keep their fine form going when they visit a Wharfedale side which is still fighting off relegation. After picking up a solid victory over Sheffield Tigers in Round 25, Dale were left frustrated last weekend as they saw a 14-0 lead disappeared as Tynedale came from behind to win at the Avenue. That result leaves the Greens still three points clear of the relegation places and with this huge test against Sale to come this weekend, Wharfedale will be hoping for a positive result. Both Sale FC and Wharfedale will certainly have an eye on proceedings in the north-east as second placed Sedgley Park travel to strugglers Blaydon in Round 26. Sedge were able to move into the top two last Saturday following a hard-fought win over Otley and head coach Matt Bebbington told us this week that the “robustness and focus” of his squad has to continue if they are to maintain their good, recent form. Sedge visit Crow Trees on a run of one defeat from their last nine games while hosts Blaydon will be desperate to string another positive sequence of results together. Back to back wins for Matt Thompson’s men at the end of February has given them a real chance of avoiding consecutive relegations, but successive defeats in March against Leicester Lions and Huddersfield has kept them in the bottom three. Despite this, Thompson is “still optimistic” that his side can avoid the drop and a victory against the odds this weekend could move them out of the bottom three. Following Stourbridge’s shock defeat to Sheffield Tigers last Saturday, Tynedale moved into the top three after their storming comeback against Wharfedale. Once again, Scott Lawson’s men dug deep to secure a victory and three wins in a row has enhanced their promotion ambitions. Tyne are just three points off second placed Sedgley Park and after a patchy run of form since the beginning of 2018, the north-east side seem to be clicking into gear at just the right time. 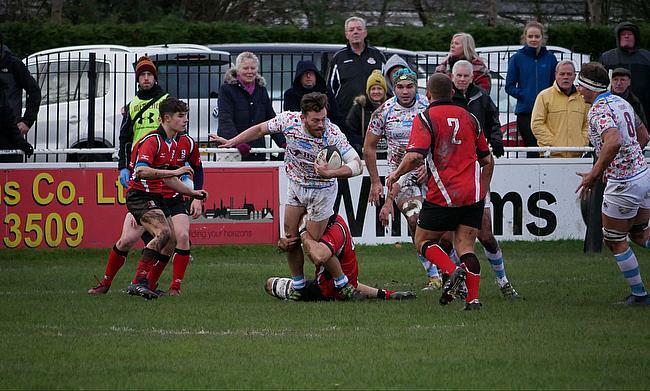 They visit an Otley side that put in a strong performance at Sedgley Park last weekend. A narrow 24-21 defeat would have been disappointing for Peter Clegg’s men, but the Yorkshire outfit have shown positive signs over the last few months. Seven wins from their last 12 matches has seen Otley edge away from danger and with six games left in their season, they are nine points clear of the relegation zone. Clegg has targeted two more wins for Otley to be safe and a victory at Cross Green in Round 26 would be the perfect start to achieving that aim. It has been a tough few weeks for Stourbridge. At the end of February, they entered their fixture against Tynedale having lost just one of their previous nine matches but since the conclusion of last month, Stour’s promotion ambitions have suffered a major setback. Defeat at Tynedale was followed by a loss at Sale FC, but their negative result against Sheffield Tigers last weekend would have hurt the most. A 28-26 defeat saw Neil Mitchell’s side drop down to fourth in the table and they are now five points off second placed Sedgley Park, but the Manchester-based club have a game in hand. Stour will be itching for a reaction and they can respond back at Stourton Park when they host South Leicester. South take the trip across the Midlands looking to build on their last result against Luctonians. Their 26-20 win was a welcome victory for the men from Welford Road after a run of six straight losses and now South will be aiming to cement a place in the top half for a second successive season. Richie Williams’ men have not won away from home since the middle of November, but against a wounded Stourbridge outfit, they may fancy their chances. After another break in their season, Hinckley return to action this weekend when they visit bottom of the table Luctonians. It has been two weeks since the Hornets suffered a surprise defeat against Otley at Leicester Road and that loss may have taken the sting out of their promotion challenge. George Chuter’s side have had a wonderful campaign, but they are now eight points off Sedgley Park with six games in their season to go. Three defeats in their last five games have come at the worst possible time in the term for Hinckley, but they have a real chance to respond against a struggling Luctonians. Last Saturday, the Lucts fell to their 18th defeat of the campaign at Macclesfield, which leaves them rooted to the foot of this division and 12 points off safety. Ryan Watkins’ side do still have three games in hand and the head coach is still upbeat that his squad can beat drop, but only if they can become more clinical. Can the Lucts show a cutting edge at Mortimer Park this weekend? Back to back wins would have done Huddersfield the world of good. Their recent victory over Blaydon lifted them into the top six of National Two North and considering they won promotion to this division less than 12 months ago, it has been a wonderful campaign for Gareth Lewis’ side. Their season was in danger of fizzling out after a tough start to 2018, but now they are aiming to end this term with a strong run of form. They can continue their momentum with a victory over Leicester Lions who visit Lockwood Park this Saturday. There was more frustration for Andy Key’s side last week as their fixture with Chester was once again postponed. That match has been rearranged for Easter Saturday so the Lions come into this clash in Yorkshire having won three of their last five matches. Key seems to have steadied the ship at TMDP Park since his return to the club and Leicester will now be hoping he can guide them to a top half finish. As we have just mentioned, Chester’s fixture with Leicester Lions was called off last weekend and whilst the Cheshire outfit were not in action, they saw the gap increase between themselves and the top six after Huddersfield’s win over Blaydon. The men from Hare Lane are now seven points off sixth place with a game in hand and after their humbling defeat away at Sedgley Park in their last outing, they will be demanding a reaction when Sheffield Tigers visit this Saturday. That loss to Sedge was Chester’s first in three matches and looking to inflict another defeat on Jan van Deventer’s side will be a Tigers side in a buoyant mood. Jamie Broadley’s men produced an outstanding performance to upset the odds to beat Stourbridge last weekend and the victory was their first away from home since November. Sheffield Tigers are now tenth in the division, but back to back wins could see them move into the top half of the table. Macclesfield’s Toby Twigg described their recent win over Luctonians as a “much more complete performance” from the Blues. After a tough outing at Tynedale, Marshall Gadd’s side responded with an excellent home win over the Lucts last Saturday to move Macc 15 points clear of the drop zone with two games hand. Since Gadd’s appointment as interim coach, the Cheshire side have turned their indifferent season around following relegation from National One and they travel to Sheffield having won seven of their last 10 matches. Having fought with Sheffield for large parts of this campaign, Macc have put some clear water between themselves and the relegation places while Sheffield are very much fighting for survival. The Yorkshire outfit are now 10 points off safety following three successive losses. Both of these sides met a month ago and Macclesfield came out on top so Adam Byron’s side will be aiming to gain their revenge as Sheffield battle for their place in this division.